Not sure what I’m now sipping, some blend a friend of I can’t remember how many years gave me, recently. I bought some of her family’s bottles, and she threw in a couple as a thank-you. Know it’s Rhône-honed, but beyond that I know little. Guessing neutral oak, and after today at the winery and all that’s swirling and swimming through a writer’s head these days, only days before 39, I’m ready to do something creatively fanatical and Carrollian. In my own Wonderland, deconstructed and redolent in imagery, dialogue and story as Mom urges. Not much traffic in winery today but all the more shove to meditate and collect, not letting self panic as I approach this old age number. Can’t let self have more than one more glass as I need early wake and work out. Know it sounds so pattern’d and banal for an old writer like me to reform and exercise, do something early in morrow, but here I am, there’s the writer… early… doing pushups, sipping coffee. This isn’t any kind of mood, with this blend, but a certain sight, the piling of musings and notes, over years and years now ready for bottling, like wine blends there on the pad, at the line, with everyone ready with those things overs their ears. I’m sure what I’m ordering myself to do just not sure I’m quite doing such— writing about wine, being that wine writer, that ‘wild wine writer’ I always profess I progress. Thinking too much won’t get me anywhere. Stuck, tired, even this morning I wasn’t sure how I’d make it out of shift but I did, from inner jotting and constant musings and decision. I decided to note all, form the caves to the one tasting I did, to the wines I tasted most regularly like the RRV Pinot and the Pinot Gris, surprisingly. Writing about wine I only quicker return to Philosophy and all the talks and back-and-forth’s Dad and I have had over years, years…. Asking self for more verse but I can only respond with a mute a void a clanking of possibilities. The floor doesn’t answer any calls from me so I look at ceiling and the fan isn’t moving, like a still horse on ground after some race, but it didn’t race a turn or touch today. on a meditative slate, scope, slope. Getting to the winery early this morrow as I often do and with iced coffee, revolving in the meta of meta-metas of wine, and the vineyard, the people that pass through here and me with renewed purpose and poise, sight, poetry about me. Wine, its own emblematic bastion in my head this morning, commanding all perception and creative election. Driving on Chalk Hill Road, looking out at buds breaking, speaking new life to me but as well new tracks, renewed and renewing tests for self.. the philosophy of which is obvious, RE-WRITE. Everything. Even the way I now write, embracing the Hunter S. Thompson logic of not caring, not excessively deliberating or collating concentrations. But just living, and living madly, wildly freely. Wine reminds us that you can wait, wait, wait more if you wish but the Now is what you want to seize upon. Wine isn’t wine, but thought, vision, sight and poetic compounding of perception and music, new intersections of sight and understanding… time capsules shelved then removed to appreciate and further learn from your current current. This morning I write so freely and with such intrinsically imbibed utterance that I forget about where the pages are going, any book I’m working on, but just write, just develop in character… Precisely what wine commands. I see Self in books, reviewing notes in the library with students around me, and this student, this bizarrely analytical penner, this morning, more a student than he’s ever been. And, from last night’s Cabernet, sipped on floor while reviewing notes and entertaining new vision and vortex for my writing life. Writing is wine… I, suis wine. Wine s language and thought and what you’d otherwise dismiss and not care to further understand. Haven’t written in my wined pages for a couple days, as I needed collect and introspect, further see what I’m to see in my story in wine, her composition. Now, I’m assembled, collected and more coherent avec plus de but. Much more. This Now, this breath, here at this polished wood table int he shape of CA, where yesterday I discussed win, life, poetry, literature, love and kindness wth new amis, I’m reminded. Reminded of my mind and where it need be. Magic in the meta, spells in this writing, a bewitching perambulation about wine and me in wine, me in this tasting room before anyone arrives. The other day, driving back from Anaheim, and a bit down here too in cruelly early horas, I considered ending this blog, and wine writing. Not sure why. Perhaps a momentary stretch of bitterness toward the industry, which happens with me from time to… But I halted it, permanently anesthetized its advance with a note, while stopped in some dry, dusty industrial town I’ve never been to and more than likely never will let into lenses again, to have lunch… scribbled, “re-write… onus… make own… make what you wish… re-blend the attributes and attractive qualities and equations and encore re-draw”. What I’m doing, this morning, at the wood table. Pinot and I have always be amiable, and noticeably amorous. Pinot is my Now, I thought while the people around me talked and paid no attention to what they were sipping, just talked and talked, which is lovely as that’s what wine embodies, the occasion. The Now… what you’re doing and who you’re with, what you want to say to that person, a right-then-and-there gala. Pinot punctuates wine’s most fundamental thesis— NOW. Though, MacPhail ushered such with unusual astuteness. With its poetic pagination and voice, coherence, way… I was transferred, with transcendental momentum and current. This character was, IS, the act of writing. Pages and pages, a narration, certain memoir parcel in one sitting, staring at vines and watching the people around me talk and laugh.. I was in immediate intersection, palate tryst. Why is this writer into wine as he is, with such bizarre and illusionary Wonderland-esque fervor, fever? For wines like this. That have me. Capture me. Lose me and find me, concurrently. Specific and jazzy alchemy. What do I do next, I thought, when near the end of my glass. Wrote, “Should I order another?” I didn’t. Sipped the last, stared at glass, the minuscule puddle and bowl’s lowest flat. This personification decided for me, where I’m going with Pinot, with wine, with these pages. Could still taste her, driving home… the verses halted none. I was, am, done… just replaying her son, stretch, texture-flown aria still around my sentences, non-scribbled musing, unedited page storm. Another wine gem, delicious discovery from my vino family at K&L. Whimsy blend, teaching me about red wine and stylistics. I sit at home and sip slow, after dinner, the optimal after-dinner sipper. Waiting on my next sip, still feeling and sensing its sitting and teach on palate. Okay, I think, time to cite notes specific and actual. Have nothing. Only enjoying its order and commanding narrative, presence and poetry about me and this room, epistolary like and Austen novel. On the floor of my home office, listening to a Hutcherson track, and leaning back, hearing the wine even above his notes. Situated in my meditation, this bottle and its unexpected offerings, gift from my oeno-allies, I collect and assemble in Plath-like intimacy. Not a confession but candid communication, the puddle professing its architect and amiable holistic. Intersections like this saunter far beyond the industry, any wine business edifice, but center the character, and me here with this whimsy-told peripatetic poem-bottle. Swirling her in glass, ‘round, tango or flamenco-found. This offering is everything that’s hoped for after a long day, with a gently pervasive douse of refinement and artful angle. A blend that has a collective identity while all the contributing voices in the symphony are heard, punctuated and sung with such suave view that you can only sit bewitched. The roundness of the Cabernet, Petit Verdot, Tannat taking a visual and sensory lead while not eclipsing the notes of the other instruments. It’s own mobile mode of jazz, a decision of cosmic expression and dimensional echo. Day 3. 08:47. Thinking about my shop, posting Elyse piece, finally. Who else do I want to sell? Everyone, in a word. Everyone has a customer, every winery had a voice and an audience. 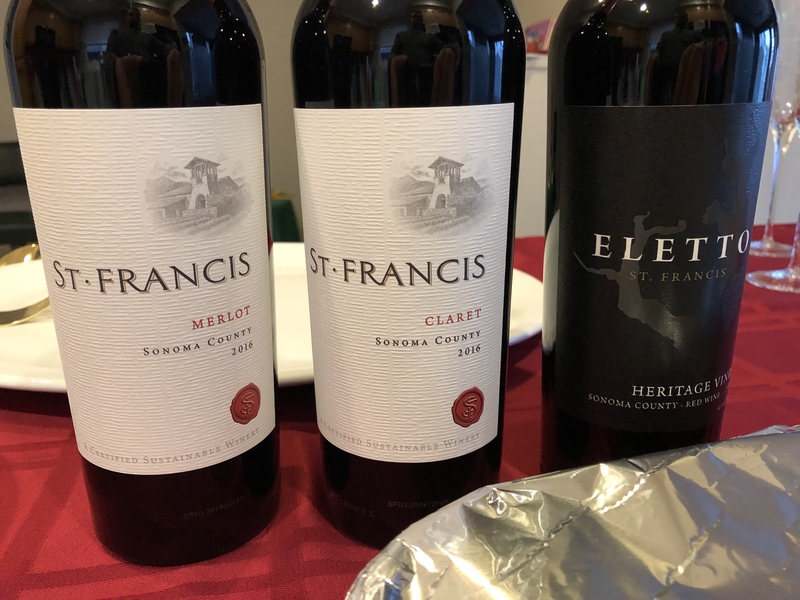 The obvious selection is St. Francis, with my and my family’s history with them, with my sister as their winemaker. But I want to think outside boxes, far outside boxes… Arista. Kaz. Whatever I want. I don’t need permission to love the wineries I do. So… I select one at a time. Remain not only demand-driven but discover-driven. I discover, as the consummate consumer, then the customer discovers something through me, my site, my shop. On this third day, I see the why to wine. It’s the people around you. The occasion. The life emphasis, the stories, the literature and recital to it all. As I get closer to 09:00, I anticipate the day. Who I’ll see and what they’ll say, what they’ll buy, then tell self to stop anticipating. Take the day as it delivers itself to this writer’s self. Wine is an entity of spontaneity. Zut! Why didn’t I wake self earlier, get downstairs and writer my daily 3000 wine words. Today, it I hit. The feel of the winery now, contrasted to yesterday’s frenzy, t he day before… teaching me. This peace with my Coltrane tracks in the office of unoccupied cubicles and desks. Tasting from barrel yesterday, my newly primed and titular wine hone and tone, seeing each character shifted from the day prior. The Pinot, taking a back-step and not as communicative and voltage-intended as Friday. Then the Zin taking my focus from my beloved AV Cab. But, when I went back and tasted both the Zin and Cab, on lunch break, the Cab retook my posture and movement, senses. Wine continues to teach me, situate me in this new morality and philosophy, thinking of my life and everything I’ve done and how the very event of barrel tasting reminds us to live, that time doesn’t wait— Not only does it not wait, it wants to push us aside and keep with the sprint. That’s why I don’t stress when the crowd spill into the tasting room, wanting one more tasting, and another, and another. One day I’ll be so old I won’t be able to stand all day. Huh… even now, me a runner and in fairly fit condition, I’m tested with an all day post on legs behind that counter pouring. Have to visit the barrels again. See what they want from me. See what precisely they have to say. They could say anything. They change. They wanted to sing different songs these last two chapters. The quixotic envelopment of barrel tasting provokes a writer, at least a writer like me. Wine… each of them. New notes, new intersections, new dimensions and lessons. Wine’s embodies so much more than anything I’m discussing. It’s a reminding symbol. We’re here, and not for long. So, capture everything. Be so into the moment you don’t regard it as a moment, but something else. Something part of you. Didn’t expect such proficient theory from Barrel Tasting. Elyse Winery. New Wine Amour. It’s no secret by now that I have a proverbial penchant for Elyse Winery’s offerings. Of all shapes and codes, everything they release like that Coltrane song I can’t hear enough. Their collective character is of a precise oenological diction that both mystifies and befuddles, and instructs me. About a month ago, I ordered four bottles— the ’12 and ’13 Mitchell Cabernet, the ’13 Petite Sirah, and ’13 Morisoli Vineyard Zinfandel. With my exploration of the label and general wine principles, I can only find my notes compiling and multiplying. Coming from the literary world I look for character and dialogue, tone and emotion in what I have in glass and how it introduces itself to senses. Each of these presences define and punctuate conviction and purpose, with their madly jazzed saunter-aesthetic, I write more, see more in each bottle, as oxygen touches the flavor composition more composition is riled, catapulted like eager angels at a wine lover no matter their “level”. These wines unify, not only with each other but stream community with wine drinkers. That’s why I intoned that your “level” is inconsequential. The Petite Sirah, my little Jane Eyre gem of a night-scape wine…. Both Cabernets, prominent and versifying songs, each narrating their vintage conditions and atmospheric posts. And then the Zinfandel, establishing a beaming paradigm of what Zin producers on the Sonoma side, or any side, should aim to manuscript. Elyse instructs us as wine pursuers while not instructing. There is no exposition, but furthered, the most inmost and immersed, subterranean expression and romance. A wine producer singing to us all, with kaleidoscopic chord and key, octave. My last bottle, gone. So now, to call them. Wondering if I should apologize for studying so swiftly…. Reading over notes, remembering, before reaching for phone. Get your Elyse bottles, NOW. Click on the link below that sends you directly to their online shop…. À votre santé! Escapist…. Geometric and ontological tryst. Letters and letters, reactions and reflections. Rich, complicated and poetically precise and composed Pinot speak. Ghostly raspberry and maple intermingle. This character is for people seeing their taste as sophisticated as well as those just curious about wine, about Pinot, what all the fuss is about. She instructs you, this Pinot apparition, shows and tells. There’s music in this bottle, clouds and limits of jazz and funk, ambient and a certain trip-hop envelopment. Elemental and constitutive codes as her expression intensifies. As more of the room’s air in the settling glass, verses are disclosed. Planetary and syllabic. Musical. She repeats her recital with those rose petal percussive pulses, light but enough assertive to land her thesis. And impression, and cognition. Watch my watch, and I’ve not only lost time but separated myself from it. I’ve escaped. It could be the wine or… no, it’s her. The wine. The Pinot in my glass. Stemless, here on the counter next to me while I listen to Miles Davis and think of my day in the Roth tasting room, how I’m contracted to see her, hear her, taste that shape, voluminously. Look at my watch, turn it upside down, pour this writer another glass as I need one after such day. She’s there, here, here for me to hear my entries and verses of question, frustration, confusion and simple observation. I stare at the color, what’s in that little vessel next to this keyboard. MY wine writing takes turns other and unexpected, just in this sitting— more cherry, more vanilla, and more of us.. here in this Now. Like a death and rebirth commingled in the day, end of day, me in my kitchen writing and her wondering when I’m going to stop and just enjoy her, her company, her song and notes, and solo sequences. Now… that’s what I do now. Pour more. She, the mentor.